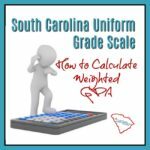 Homeschool law in South Carolina mandates some basic record-keeping requirements. 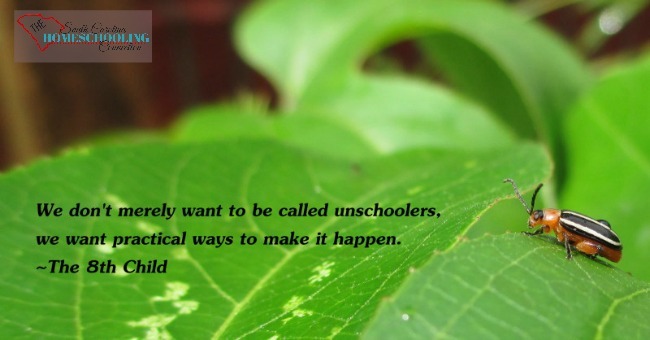 So, what if you are an unschooler and you don’t actually plan ahead? This is how one unschooler does her journal. 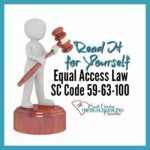 How do we maintain the records required by law? 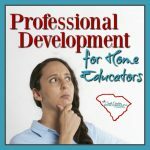 These are the most frequently asked questions I hear when talking with other homeschoolers and those curious about homeschooling and unschooling. 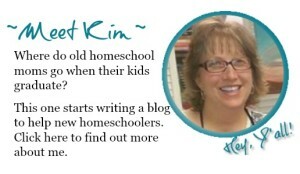 Remember the real reason you should keep good homeschool records. As unschoolers, we don’t use a set curriculum. We don’t get up in the morning and do school. In fact, we don’t “do school” at all. Unschooling is learner-directed education. We live our lives and learn as we go. We pursue our interests, volunteer in the community, balance our budgets. We care for our animals, try new recipes, go for walks. We gather with friends and family as often as we can. We do the day-to-day things that everyone else does, building upon each experience. What documents do we have to maintain? 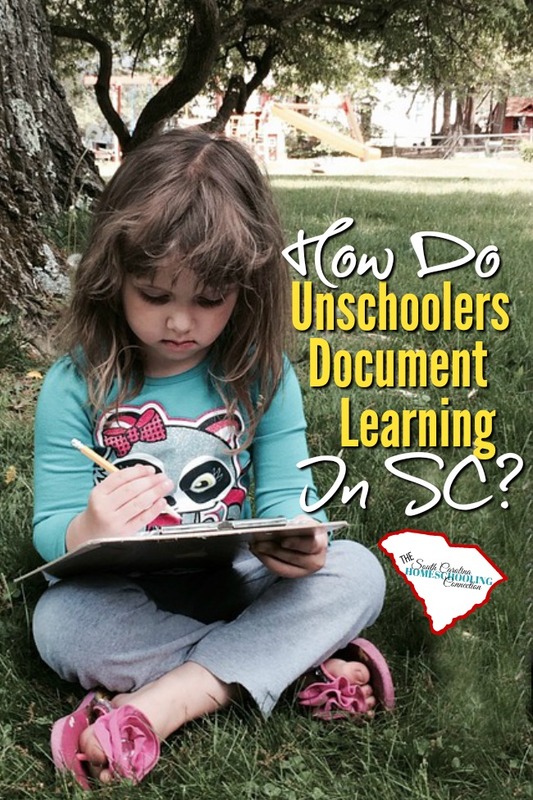 Here in South Carolina, the law requires 3rd option homeschoolers to maintain some basic documents. One of the required documents is a lesson plan book or a journal. Since unschoolers don’t use a planned curriculum, it’s difficult to plan ahead much. It’s easier to journal along the way or at the end of the day (or week). The basic subjects we must include are: Reading/Writing, Math, Science and Social Studies. You can also add anything else you want to study, like World Languages, PE, and Fine Arts. Ask any group of unschoolers what their journals look like, you will get a wide array of answers. Some people like pretty forms with lots of color. Some prefer to make their own. Some use planners. Some use composition books. Others prefer to use an online program or simple excel worksheet. There isn’t any one set way. Finding what works will be a process of trial and error as children grow and needs shift. There is no wrong way as long as the minimum required by law is maintained. 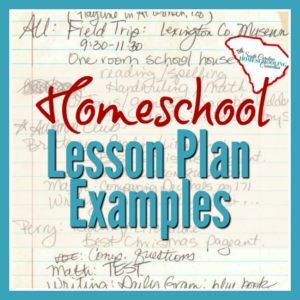 Your homeschool records belong to you and your child. Make it meaningful to you. What do I put in the journal? When we first started out I wanted to see examples of actual records. 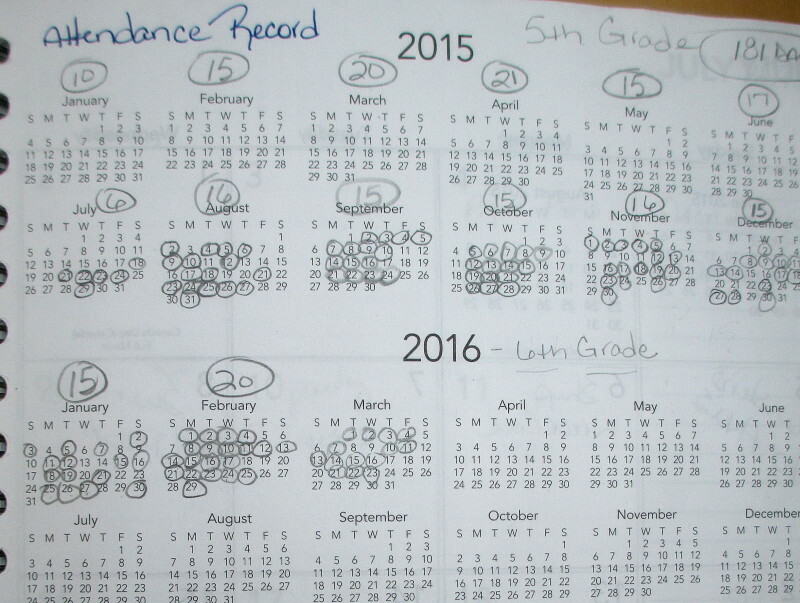 I wanted to look at how other families kept attendance and how they documented their days. I found tons of forms online, but very few actual examples. I’m a visual person. I needed real life examples! So here are a few pages from our official records. 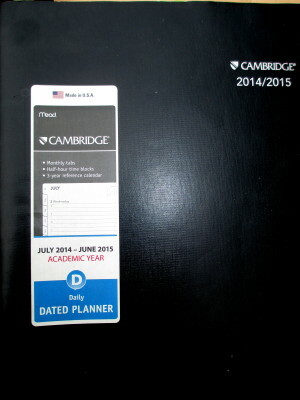 The planner book: I have used the Mead/Cambridge planner for the last 5 years. 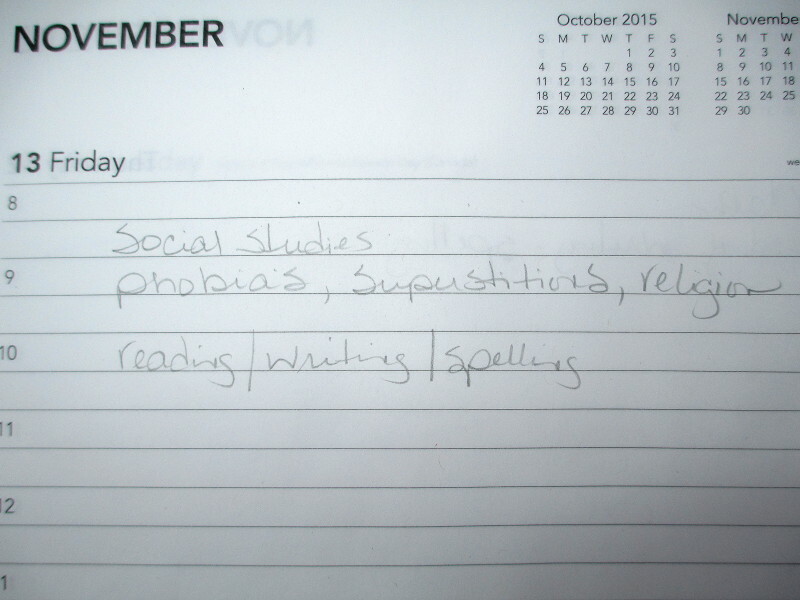 I started out using this as just my daily record, keeping a separate form for attendance. After that 1st year I developed a method of keeping everything in this one book. Attendance calendar: My planner includes an attendance calendar. 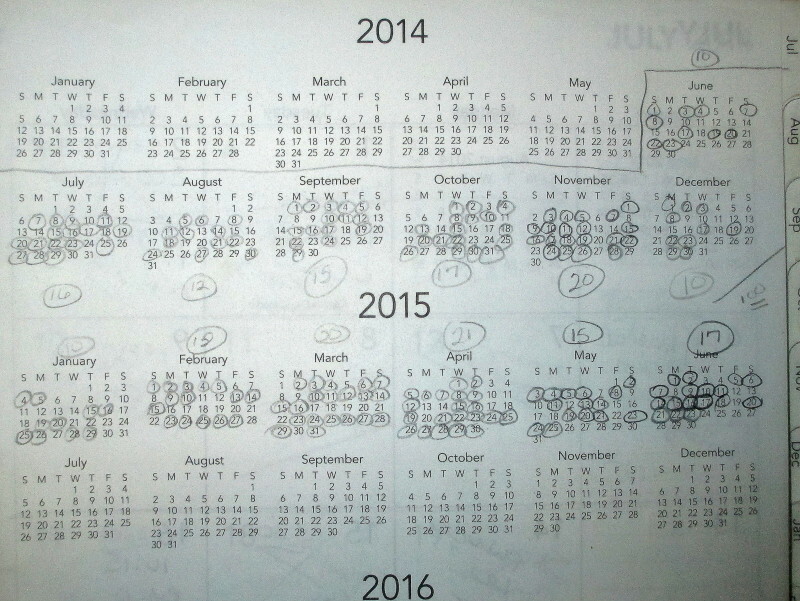 Since we have to document 180 days per year, 2014-15 was a transitional year for me. I switched from keeping attendance for the academic year (June-May) to the calendar year (Jan-Dec). I decided that was easier for me to keep up with. Hey, nothing else we do is traditional. So who is to say I have to keep the traditional academic year? NOTE: Some associations require attendance reporting be documented between specific dates. So be sure to know what your association requires or allows. Daily Log: In November, my daughter’s interests in fandoms, role play and fan fiction took off. She began to write her own stories. This is a short list of some of the things she asked me how to spell that particular day. I spelled many words a day for several weeks. I intended to record all the words she asked about. 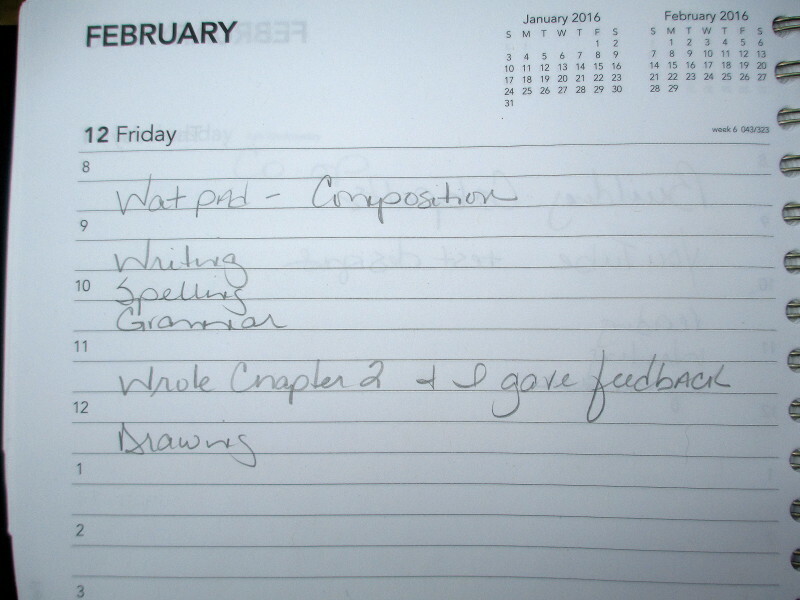 However, there were so many and my planner wasn’t always handy so I settled for an incomplete list. The perfectionist in me was a little disappointed, but this gives a good idea of what she was learning. This example day happened to be Friday the 13th. The question of the day was about why people thought it was bad luck. We spent the major part of the afternoon researching the history of Friday the 13th and all the lore surrounding it. That topic delves deeply into several branches of Social Studies. Fast forward 3 months, her passion for writing is still strong. I spell words much less often now. In this short span of time my daughter has become nearly as proficient in spelling as many of the adults I know. 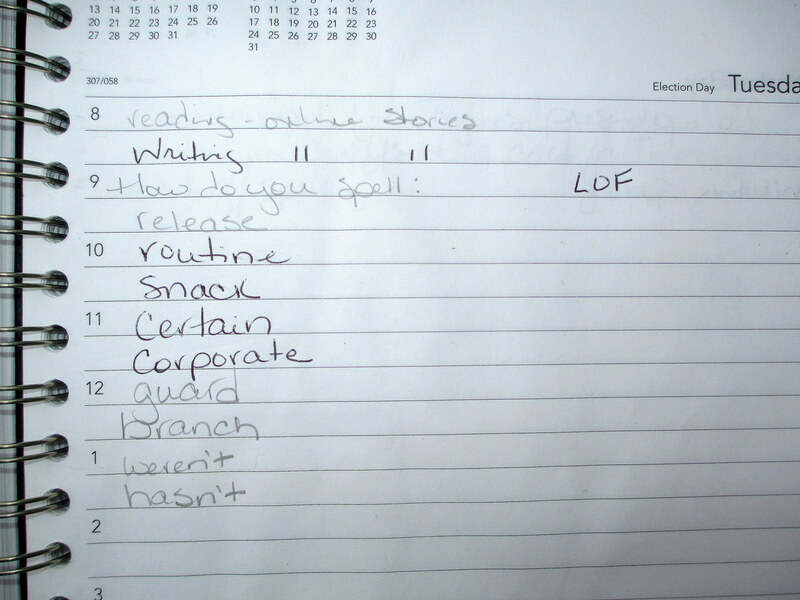 All without phonics drills, worksheets or spelling tests. Some days, we document more math or science. Others might include a lot more details. This is enough for me to know what learning was happening then. Some unschoolers categorize by subjects later. The daily journal might include building a birdhouse. But, the categorizing of math (measuring) and reading (following directions) isn’t necessarily included in their journal. In addition to our planner, I use pictures and a facebook page to document our learning activities. I add photos to an album that is synced to upload to online storage. It’s a nice way to look back and see all the experiences over the course of a year. The facebook page helps me and my daughter to keep up with things we are exploring. Don’t let record keeping intimidate you. Remember, you get to choose the method or madness of journaling that works best for you! The planner I had isn’t available online, but here’s some others that are similar. It’s most important to find one that works for you. 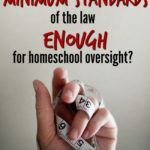 Are Minimum Standards of the Law Enough?